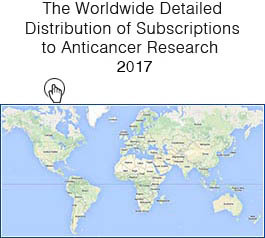 Anticancer Research is an international journal designed to rapidly publish original papers and reviews on experimental and clinical cancer research. Anticancer Research was established in 1981 by J.G. Delinasios. In this site you may find information concerning the editorial board, editorial policy, subscriptions, submission of manuscripts, online open articles, advertising, special offers for authors and a current list of accepted manuscripts. 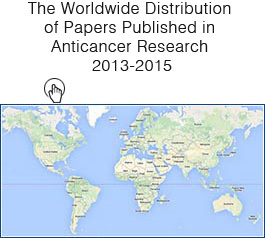 All content of ANTICANCER RESEARCH published between vol. 24, 2004 – vol. 35, 2015 is online available free to all. Please print and complete this form. Send or give the completed form to your librarian to recommend Anticancer Research. Your link to essential information on cancer research published in the last 37 years. Editorial office: 111 Bay Avenue, Highlands, NJ 07732, USA. 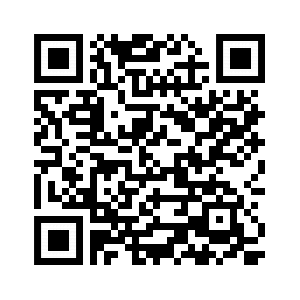 Mailing address: Anticancer Research USA, Inc., P.O.B. 280, Belmar, NJ 07719, USA. 1st km Kapandritiou- Kalamou Rd., P.O.Box 22, Kapandriti, Attiki 19014, Greece.